NYC, 02/26/2019, 6:00PM. Interior Life: Intimate Spaces. 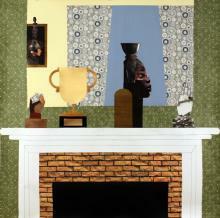 An exhibition of new works by artist Derrick Adams. Inspired by a tenet of Catholic theology that describes "a life which seeks God in everything,” Interior Life is a mediation on the intimate spaces of one’s mind and home, each an analog for the other. The exhibition includes new portraits on paper from the artist’s ongoing Deconstruction Worker series, installed on custom wallpaper depicting imaginary domestic environments. Adams’ spatial exploration of the relationship between the intimate and the infinite finds an ideal setting at Luxembourg & Dayan’s New York gallery, which resides in the second smallest townhouse in Manhattan.